Laine Hardman can be reached at TidyUp.Laine@gmail.com, 703-401-4829 or http://www.TidyUpNow.com. For those of us making the best of small-space living, furniture that doubles as storage can be a godsend. You don’t need custom-built or pricey pieces. Finding furniture that increases your home’s storage capacity without gobbling up tons of square footage can be fun! 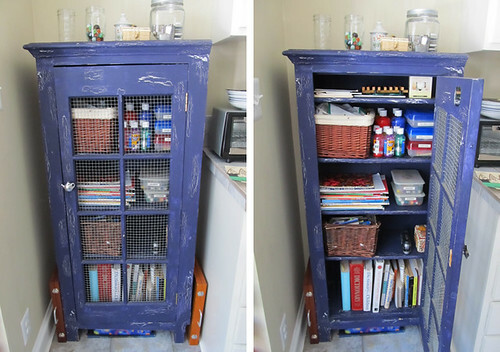 Here are some creative examples of furniture that doubles as storage. I found this old pie safe on the curb nearly twenty years ago. It was yellow and had glass panes with ducks painted on them. I painted it blue and removed the glass, replacing it with chicken coop wire. It now stores the kids’ arts and crafts supplies, my cookbooks, trivets, etc. I use this piece so much that when I renovated my kitchen, I left a space for it. Next postWhy do you love living in Alexandria?